The automatic electric/gas frying machine is widely used for processing peanut, soybean and other nuts as well as puffed food, flour product, meat, aquatic products, etc. The process of feeding and discharging is fully automatic. 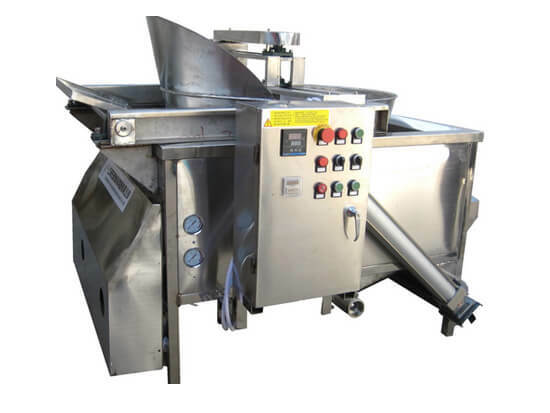 This automatic frying machine is specially designed for frying small size material like all kinds of peanuts, seeds, etc. 1. Wide application: this full automatic frying machine can be used to fry various nuts like peanut, soybean as well as flour products. 2. Adopt PLC control system, you can set the frying time and deoiling time, very convenient. 3. Square and round shapes of frying basket for your choice. 4. Two heating methods: electricity or gas. Fryer maintenance involves regular cleaning and inspection of both the machine and the oil. The fryer itself has to properly care. Also, the oil needs to be filtered and changed regularly to the ensure the fried food flavor and color.